Real Estate Lawyer Dallas: Welcome to Our Blog! Welcome to our blog, where you’ll find helpful posts about our various practice areas as well as related news events, trivia, and whatever else we think you’ll find useful. Most areas of the law are quite complicated, and real estate law is no different. We want you to be able to approach your real estate litigation with knowledge and confidence. When you’re finished browsing the blog, make sure to check out the rest of our site, and discover what our real estate lawyer in Dallas can do for you! Rachel Khirallah was admitted to the Texas bar in 2005. She specializes in real estate law including mortgage and lender litigation as representation for either side, deed restriction litigation, landlord/tenant disputes and owner-financing litigation. She has experience representing homeowners, landlords, tenants, potential buyers, contractors and others. Foreclosure law, including wrongful foreclosure, is a major part of Rachel’s practice. If your house was illegally foreclosed on and you were wrongfully forced from your home, or if you are in the middle of a fight to keep it, contact us today. Have other needs related to foreclosure litigation? Ask about our free consultations! 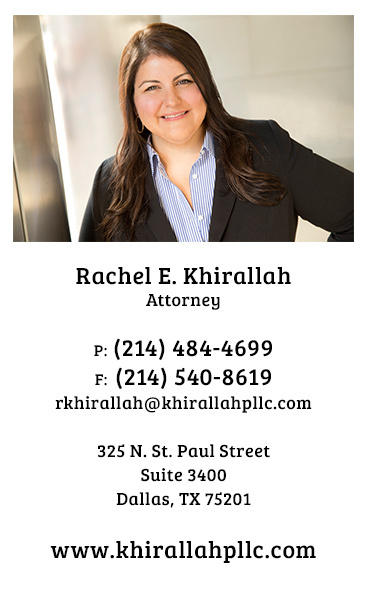 Rachel Khirallah also specializes in construction disputes such as construction defect litigation. If a liable party failed to disclose a construction defect in your house to you, we can help hold those people responsible. She regularly represents homeowners who discover things in their homes such as a damaged foundation, improper drainage and consequential flooding, or a termite infestation. No one wants to be surprised by construction defects, but if it happens to you, let us take care of it.